What do you mean, I can’t be jumping into June the month is almost over? Well in all honesty I started jumping into June on May 30th to be exact, in a different version of the same jumpsuit. (this post is full of silly) If you were on Instagram for me-made-may, maybe you saw my impersonation of the Statue of Liberty, before my flight to NYC that day, kindle and light bulb at hand. And that was not the first time I attempted that jump into June, oh no, I had one more go on the same jumpsuit in yet another fabric. Please see evidence below, when the zipper broke as I was unzipping it so I stayed trapped in it for a while. The Gods were against me on that one, because soon after, it let me go, it got caught up on the overlocker and acquired two holes, at which stage it moved to the upcycling/destroying completely pile. For those who don’t know about Jumping into June, you can find all the details at the residence of Handmade by Chris, you still have time to join. 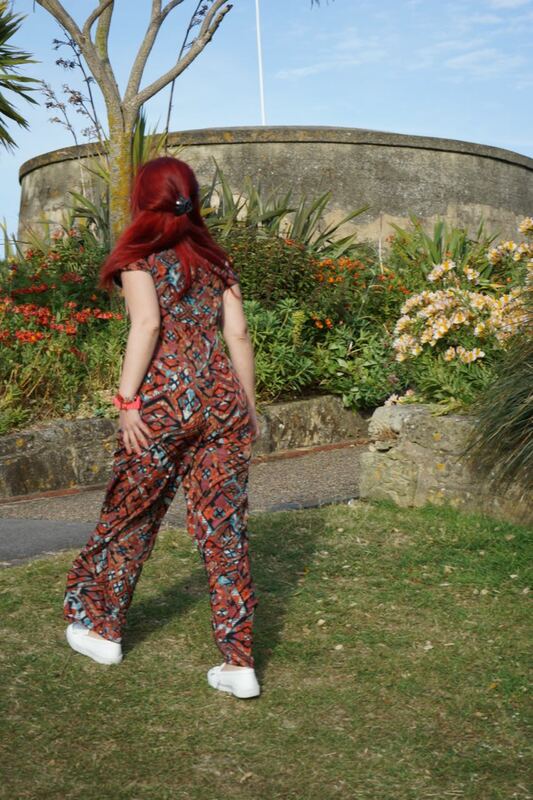 The day these photographs were taken was a very windy one, so it’s really hard to see the shape of the jumpsuit, but as you will see on the indoors pictures it features, wide legs and isn’t very fitted around the hip waist area. The waist rises just below the bust, whereas the bodice of the dress has Kimono (not sure what they are called) sleeves, a boat neck and pleats on the front and the back. This is the first time I made something from Lekala and this is their 2024 jusmpsuit. My version looks nothing like on the model but that’s perhaps because I unfortunately lack the 2 metres long legs hehe! I took the option with the seam allowance. The instructions were only two pages, so not much there but some of the construction is self-explanatory, I thought. The only thing that baffled me was the fact that the pleats of the top wouldn’t align with the darts of the bottom and I had to move them quite a bit, but maybe this is me and not the pattern. Other than that, I really enjoyed making all three versions. The pattern calls for a lined bodice but I thought that would make it quite warm so I finished the edges with bias tape. The only alteration I made was chopping about 2cm of the back where the zipper fits but I usually do that to remove some gaping. Unlike other jumpsuits, this one has more of a mechanic’s uniform feel to it and I don’t mean that in a bad way. To me it is a very comfortable pair of trousers that is already combined with a top. The fabric is a lightweight crepe Ikat. 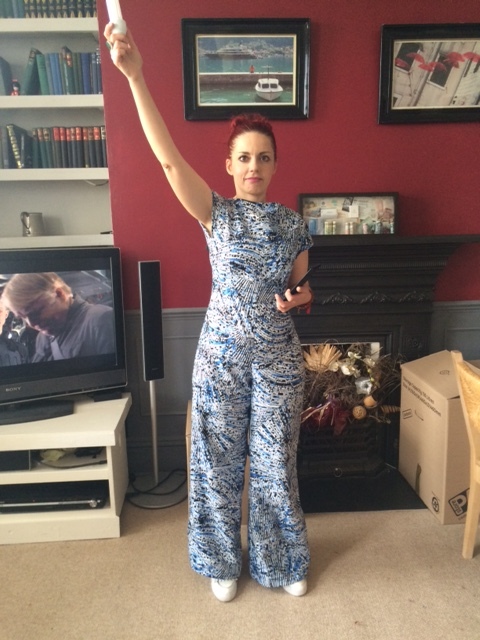 The blue one was cotton and I think I prefer this jumpsuit in the stiffer fabric as it holds the shape better. I have to warn you though, the toilet is a nightmare, especially if it’s the plane tiny one. 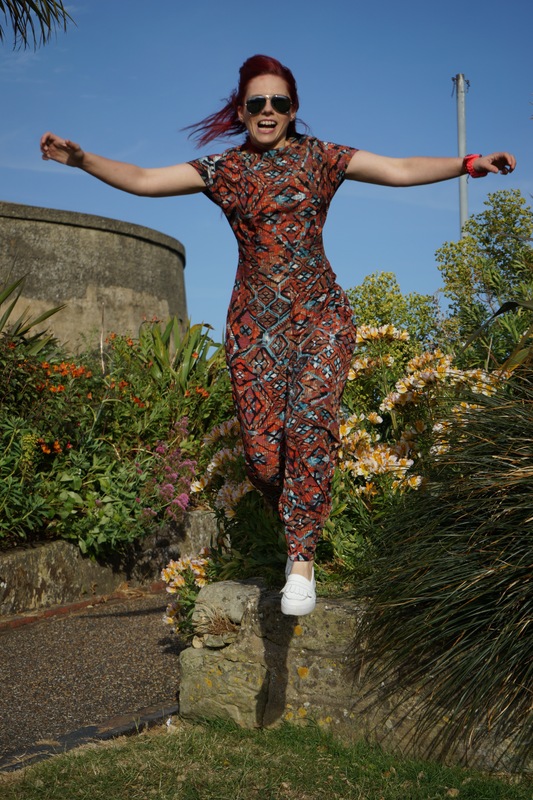 This entry was posted in sewing and tagged #jumpingintojune, handmade, ikat, jumpsuit, lekala2024, sewing. Bookmark the permalink. It looks super cool! 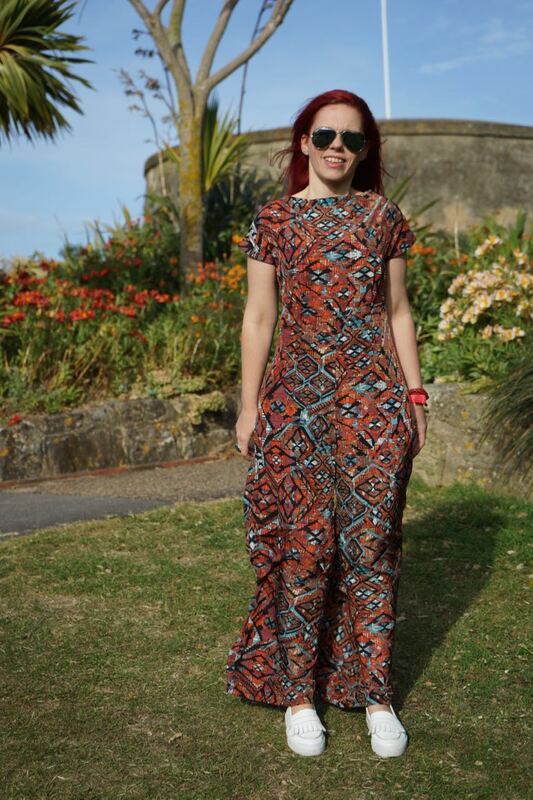 Love the fabric, and it is a very flattering style on you 😀 Thanks for the pattern review! Thank you, I think it takes accessorising as well, so will try some of that next time I wear it! Wow it looks amazing! Really suits you. Nice scenery too! Well I joined ages ago but I will be jumping into July I think! July is also good haha! It can be your giant leap 🙂 thank you, scenery’s just Eastbourne but they had a nice arrangement of trees and flowers there! Πολύ ωραια φόρμα,και οι πρώτες φωτογραφίες ειναι φανταστικές :). Έχω και εγω στη λίστα μου να ραψω μια φόρμα δεν ξέρω όμως ποτέ θα καταφέρω να το κάνω. Ευχαριστώ πολύ! Οι φωτό έχουν μια άλφα γελοιότητα αλλά χωρίς γέλιο δεν γίνεται τίποτα! Κι εμένα πάντως μου πήρε γύρω στον ένα χρόνο να τη ράψω την φόρμα από τότε που πήρα το πατρόν! Είναι καλό πρότζεκτ για κάτι διαφορετικό! Thank you! One thing it does is definitely that it goes with the wind haha! It is very comfie! Love your newest fabric – very cool! Love your jumping too! Haha, that photoshoot is just the best! And that fabric is totes amazeballs! 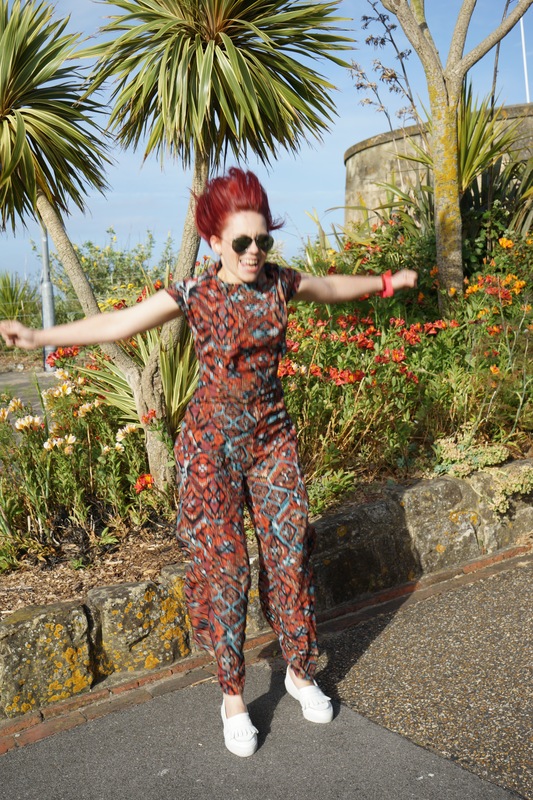 I commiserate on the broken zip issue: I broke the zip of my Holly jumpsuit the other day, mercifully before going out so I could wrench myself out of it and wear something different. Lucky escape! Thank you, glad you enjoyed it. You are very lucky to have escaped your garment that easily, who would have thought they can become so dangerous? hahah!